"In an era when external forces are guiding the hands of teachers with little concern for the needs of specific students, it is refreshing to watch a teacher who listens to her children's questions and statements to find substance for the teaching points she will create for them." From the first chapter of Ann Marie Corgill's Of Primary Importance you experience the swirling energy, the sights, and the sounds of a primary classroom. "Step inside" she says, "and breathe the writing workshop air with me. Take a look at a primary classroom, and take a minute to watch and listen and see real learning, real writing in action." Throughout these pages, you'll see Ann Marie guiding her primary students into deep and meaningful explorations of a wide variety of fiction and nonfiction. Watch as her classroom community progresses into eager and independent writers speaking with clarity, voice, and an undeniable understanding of the power and purposes of putting pen, pencil, crayon, and paper to work! Forming the heart of the book are detailed units of study on poetry, nonfiction, and fiction writing that provide a clear demonstration of the writing workshop process at work throughout a school year. You'll also find examples of favorite texts for teaching various craft components, ideas for classroom organization and where to purchase materials, suggestions for publishing student work, lists of professional resources and, most importantly, inspiring examples of what children who are empowered to write can and will write. Of Primary Importance is not a how-to manual as much as it is a celebration of the idiosyncratic journey of teaching young children to write. If you are a grade-one through grade-three teacher struggling to get your students writing well, if you want to push your writing workshop to new dimensions, or if you are just plain skeptical that primary kids can write something beyond "I love my mom. I love my dog. The end," this book is for you. You will come away inspired, challenged, supported, and wiser in your classroom writing instruction. If it weren't for those scary numbers, Ann Marie Corgill wouldn't be a teacher today. "I wanted to be an architect," she says. "But I was afraid of the math classes." Now, in her fifteenth year of teaching, she can't imagine being in another profession. 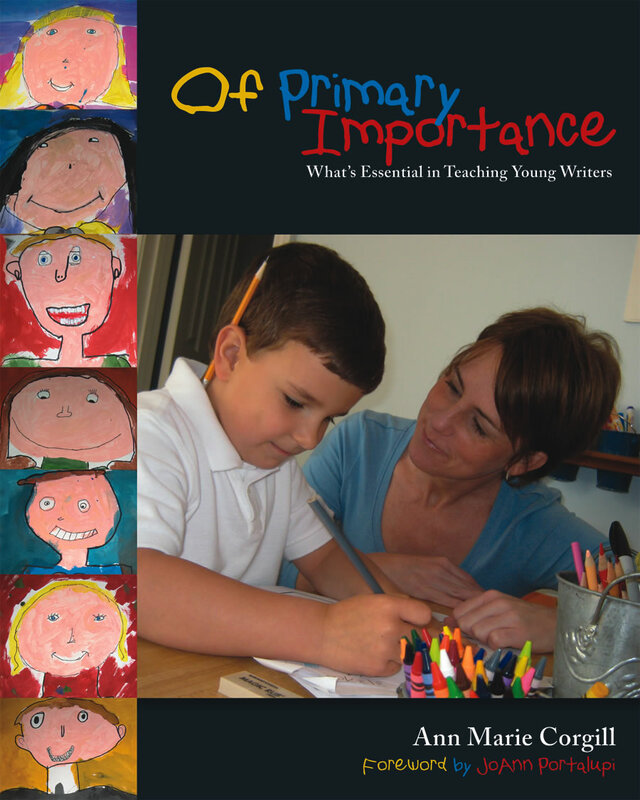 Chapter 1: What's Essential in Teaching Young Writers?